The color and decoration of bedroom is an indication of the person’s character and mentality. Accordingly, the child’s room is of more importance than the parent’s, since it directly influences the character development of our dear children. 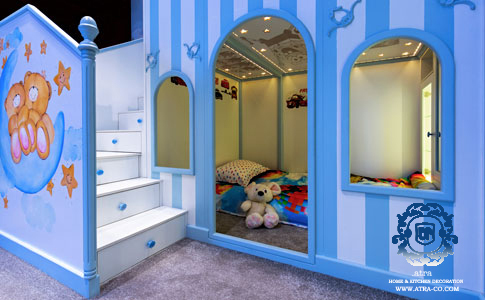 A beautiful, exciting room greatly helps with progressing the separation of child’s and parent’s bedroom. Also, the resting and playing place of children affects their mental and behavioral wellbeing. This decoration consists of three parts. The wardrobes, play space. The roof is one of its unique feathers, with its special composition, engravings and LED lighting for providing a more relaxing experience. In the wardrobes, there is a good space for children’s clothes and toys, with the handles being from silicon materials and safe regarding possible impact while playing. The material is a combination of MDF and acrylic, with wood engravings. The drawings on the body and door of the wardrobes are handcrafted. 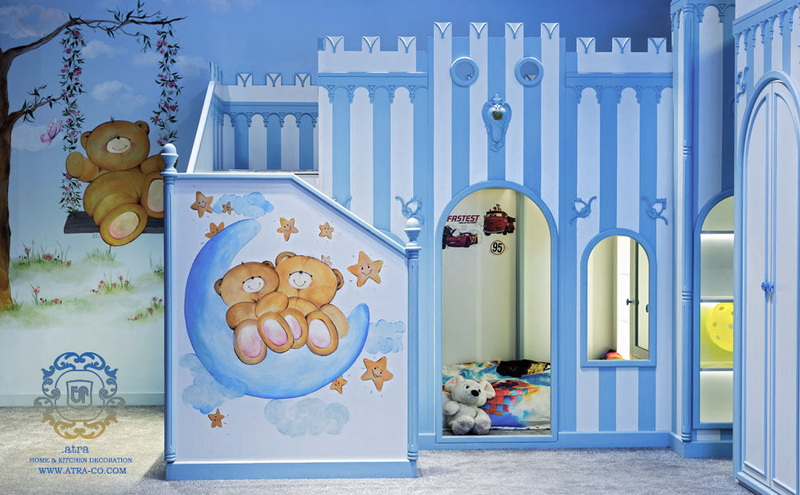 The unlevel design is one of the attractions of the decoration, safely connecting the play space to the sleeping space via stairs. Functional utilization of all the seemingly wasted and unusable areas is one of the design merits of this model, with the stairs being collapsible. The default bed sizes are for the infancy to teenagehood periods, yet are changeable based on client demand.